Abstract: Scythe's Mugen Max heatsink weighs 870grams and stands 166mm tall. 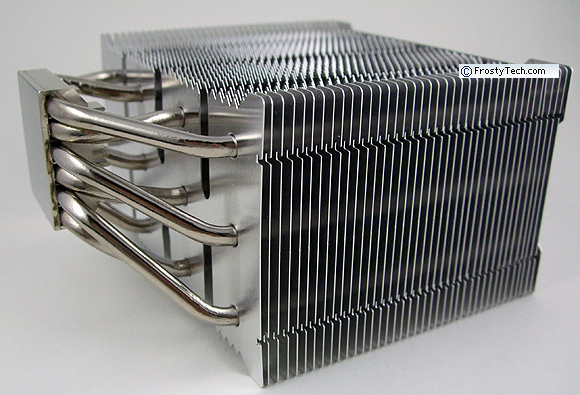 The heatsink is constructed around six 6mm diameter copper heatpipes which are soldered to a 2mm thick nickel plated copper base plate. 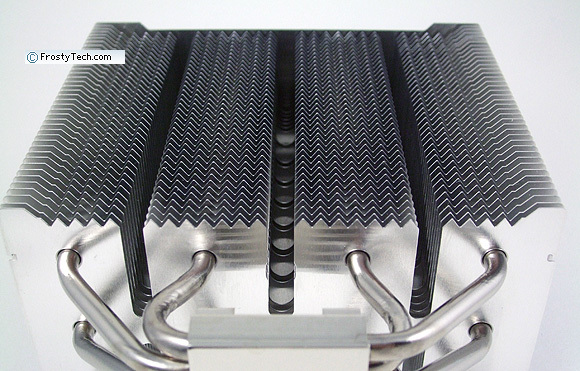 The heatpipes are swaged into a 113x145x84mm aluminum fin stack which is roughly broken up into four nearly-separate cooling towers. Scythe are one of the most prolific thermal solutions manufacturers we know of. 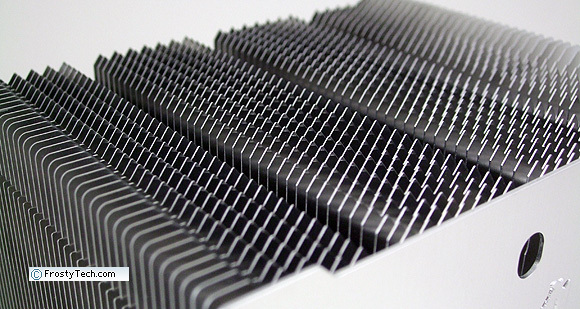 It seems like the Japanese manufacturer is continuously revising its heatsink designs into second and third generation models, yet it never lets slip a generally quiet level of heatsink operation. 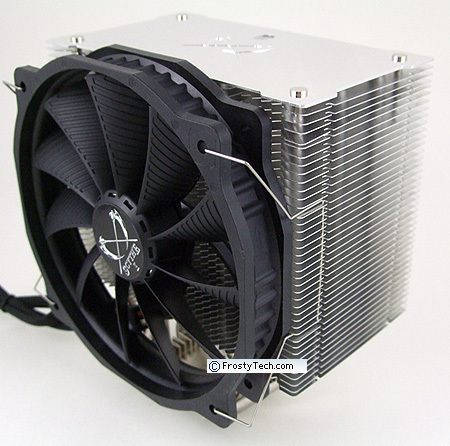 Innovation is the lifeblood of CPU cooling but in this day and age of cookie-cutter liquid coolers, it's reassuring to note that Scythe heatsinks always look uniquely Scythe. On the test bench today we have the Scythe Mugen Max (SCMGD-1000) heatsink; this is a lower-noise tower heatsink built for full sized cases. The Mugen Max is constructed with widely spaced aluminum cooling fins that offer less airflow resistance, so a relatively low pressure (1.02mmH2O) 140mm PWM fan can be used that operates at a quiet 1300-800RPM. Scythe include extra wire fan brackets for users who prefer to run two fans, front to back, at very low RPM. Scythe's Mugen Max (SCMGD-1000) heatsink retails for about $75USD/CDN and is compatible with AMD socket AM2/AM3/FM1/FM2 CPUs and the full line up of Intel LGA2011/1366/115x/775 processors. The Mugen Max comes equipped with one of Scythe's new "GlideStream 140 PMW" fans. The top surface of each impeller blade on this fan features a series of shallow slits which Scythe claim reduces air resistance. Airflow is said to also be improved by designing the fan with a relatively compact 40mm diameter motor hub, whereas other 140mm fans might have a 45mm or 50mm diameter motor hub. As is usual for Scythe, the fan is mounted with low profile wire fan clips that lack thumb tabs. Wire clips with big tabs can potentially bump up against the back of a videocard in the confines of a computer case and short out an electrical component. The aluminum fins of the Scythe Mugen Max feature two interesting design choices; first, the leading and trailing edges are saw-toothed to break up the surface profile and reduce back pressure as air tries to enter the fin stack. Secondly, the monolithic aluminum cooling fins are more or less broken up into four separate, 31.5mm wide mini-towers. 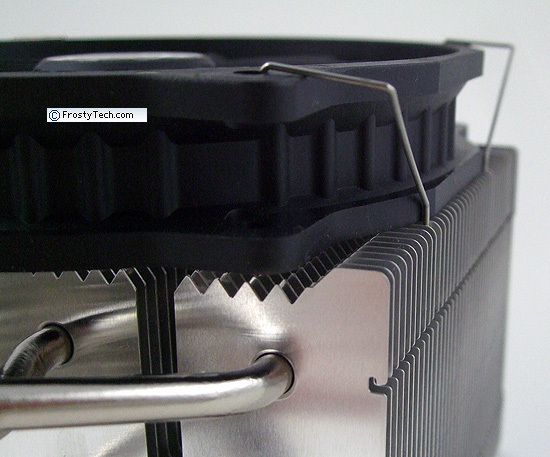 It's a little easier to see how the aluminum fin stacks are separated by looking at the heatsink from below. Each sub-tower has three heatpipes traversing the full 114mm height, at a distance of ~20mm from one another. The six nickel plated heatpipes are swaged into an aluminum base cap, which partially squishes the heatpipes into a sort of oval "D" profile. Rather than leave the heatpipes exposed at the base, Scythe solder a 2mm thick nickel plated copper heatspreader on top of the heatpipes. The soldered sheet of copper creates a smooth mounting surface and prevents the heatpipes from potentially shifting after (many) repeated heating and cooling cycles. Multi-core processors can develop hot spots in certain regions of the CPU die, so a heat spreader is also useful in this regard. The only problem with this particular heat spreader is that Scythe have not machined the surface after it was bonded to heatsink, consequently it's slightly convex, as we'll show you momentarily. The Scythe Mugen Max heatsink accommodates Intel socket LGA2011/1366/115x/775 processors and AMD socket AM2/AM3/FM1/FM2 CPUs. 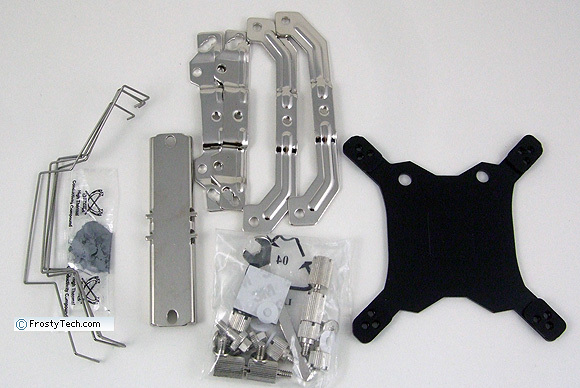 The heatsink ships with a metal rear motherboard support bracket, a variety of metal mounting brackets, associated hardware and an extra set of wire fan brackets. A small pack of grey thermal compound is also provided.